It goes without saying, but homeowners in Atlanta can certainly take advantage of the summer days with outdoor living spaces. This is especially true when you choose to create an outdoor living space around your pool, which will allow you to encourage your family and friends to spend time outdoors and enjoy some fresh air. With today’s busy lifestyles, families want to be able to enjoy their outdoor living spaces every minute of the day—even after dusk. 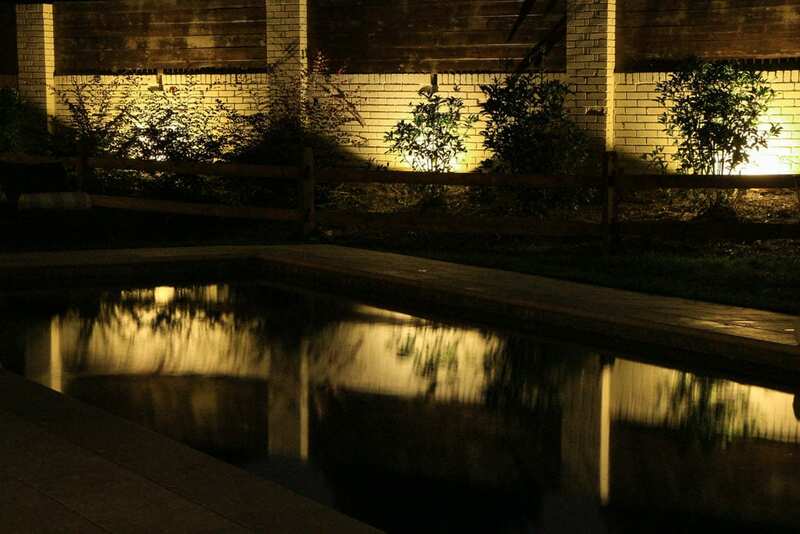 This is why we — the outdoor lighting experts at NightVision Outdoor Lighting — have provided a few exterior lighting techniques that will let you achieve a dramatic look while providing a safe, cozy, people-friendly environment. Around the pool, you should have both functional lighting and mood lighting. At night, most people spend little time swimming; they’re more likely to be cooking and socializing. You want lighting that’s conducive to all of that and creates a pleasant experience, so avoid anything that looks like a harsh spotlight across the pool – instead, use combination lighting effects to illuminate elements around the pool. Like the illumination from the sun and the moon, the most natural form of lighting comes from above. If a tree canopy hangs over the pool deck, moonlighting can create a mystical effect. You can put moon lights in tall trees or off the side of the house. Soft, uplighting adds a touch of class to any setting or you can go with path lighting — which is a much smaller version of downlighting. This popular fixture treatment displays streams of light along walkways, remember that nit all walkways will be used at night. The landscape surrounding the pool area can act like a backdrop; it can create the perfect lighting canvas. Many landscapers now are showcasing beautiful water features or water falls. Be sure these features are not over lit and that the right color temperatures are used and that you are not competing with the lighting that may already be provided from inside the pool. Finally, a lighting technique that will define the property or boundaries by softly washing the pillars of the walls with a soft warm light is wall washing. This technique can truly refine and finish off the pool area and provide that feeling of balance and composition to your landscape. Exterior lighting not only adds to the ambiance and atmosphere of a pool area; it also adds safety and security. There is no shortage of ideas or possibilities when it comes to exterior lighting. The team at NightVision Outdoor Lighting will gladly discuss lighting ideas and possibilities for your home. Contact us or give us a call today!